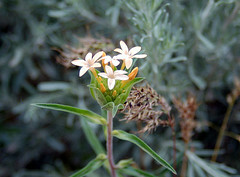 The large-flowered collomia grows from a single branching stem up to three feet tall with narrow leaves one to three inches long. The unusual peach- or salmon-colored blossoms with blue stamens at the center are arranged in many-flowered heads. Five petals fuse into a long, narrow tube concealing nectar at each flower’s base which only longer-tongued insects such as butterflies and moths can access. The violent expulsion of the seeds from the ripe capsule help the plant travel to new ground, and the mucilaginous threads of the seed coat may help the light seeds stick to the ground where they fall.